So I know its been forever and more since I last posted.. You guys must really be annoyed, no? I have a million excuses, the most genuine ones being my broken camera! Whats a beauty blogger without her camera?! and that I have been very busy with some work. :) Just too much work.. and now me and my mum are planning to come up with something nice too.. But there'll be other posts for that. I promise! But most of all, I will be honest, I dint feel like posting really.. I know, I know.. whatever happened to "I'm so over everything crappy! I'm absolutely fine now!" Great Ik.. Go underground immediately after people expect you to be normal again! 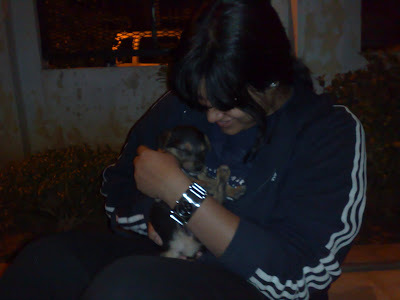 So I show you pictures. But I must say that I am back solely because of all you people.. all the tweets, mails, messages on facebook.. I love you all. You are indeed true friends.. You guys had my back and stayed with me. I lovvvvveee you!! I am back, not with a post of my own (no camera) but with the announcement of Lotus Herbals introducing a new range of foundations, called 'Pure Radiance'. Lotus Herbals has introduced a new range of liquid foundations PURE RADIANCE™ with SPF 20 under its Cosmetics Ecologique make up range. 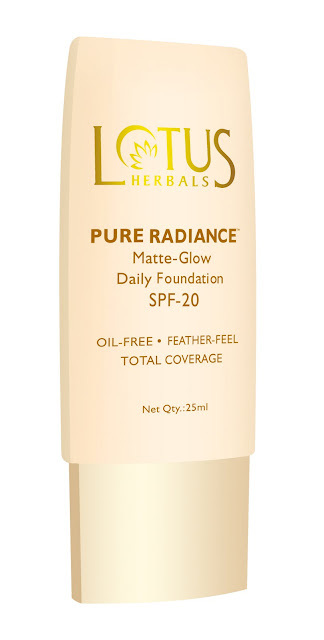 Lotus Herbals PURE RADIANCE™ foundation is natural and safe and is perfect for daily use. Lotus Herbals PURE RADIANCE™ foundation is enriched with botanical extracts of Jojoba, Soy Lecithin & Grape seeds. It is oil-free and water based and gives full coverage to the face that helps in hiding any imperfections. This feather feel foundation also gives a smooth satiny texture to your skin. This innovative foundation has SPF 20 that gives complete sun protection, making it the ideal foundation for both day and night usage. Lotus Herbals PURE RADIANCE™ foundation comes in 3 exciting shades of fresh ivory, soft beige and caramel. These shades are also available with “Light Reflection” texture that makes your skin look clearer and brighter, leaving it with a light shimmery glow. Priced attractively at Rs.175/-, it is available at select premium beauty and department stores across the country. So choose a shade to find a “Brighter You” everyday with Lotus Herbals PURE RADIANCE™Foundation. PS: The info was provided by the PR. this surprisingly sounds really good! you posted after a month!! even i was gone for 10 days, but u broke my record :) hope we're both regular now.. I will try to as much as possible! :D Yay! welcome back you too! Hi Anshu!!! :D Of course I remember you! :) Ho are you doing? How is the strawberry garden and your cute son? Maha! my love, I am embarrassed by how many times I've been "welcomed" back! 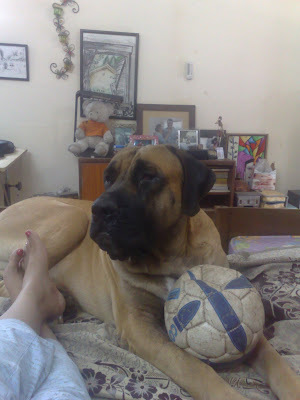 :P Laika is a pariah dog.. she found me on the street near the club I used to play at then.. she was lost and it was raining and she came out of nowhere and tried to climb my shoe.. :)I loved her then and do so now.. My friend decided to keep her..
Maha, I am so sorry to have missed your comment!! :( I shall let Zorro know! Btw, You HAVE to get on to twitter!!! Hi..m happy that u remember me...m gud...wish u all the best...for u'r blog..tc..